A couple leaving from Los Angeles were supposed to fly to Dakar, Senegal via Istanbul. Instead they ended up in Dhaka, Bangladesh nearly seven thousand miles away. How did it happen? In December, Turkish Airlines handed Sandy Valdivieso and her husband Triet Vo for LAX to IST (Istanbul) to DAC. When they booked their tickets they had no idea that DAC wasn't the three-letter airport code for Dakar, but rather Dhaka in Bangladesh. Valdivieso and Vo didn't suspect anything was wrong in the first leg of their flight to Istanbul and they didn't think anything was wrong at their transfer. Even when they were on the second plane and the flight attendants announced their destination, they didn't think anything was wrong. "When the flight attendant said we were heading to Dhaka, we believed that this was how you pronounced 'Dakar' with a Turkish accent," Valdivieso told the LA Times. They fell asleep after boarding, but when they woke up, the couple realized the in-flight graphic showed the plane over the Middle East and that all the other passengers were Asian, not African. "That's when we knew a serious mistake had been made" said Valdivieso. 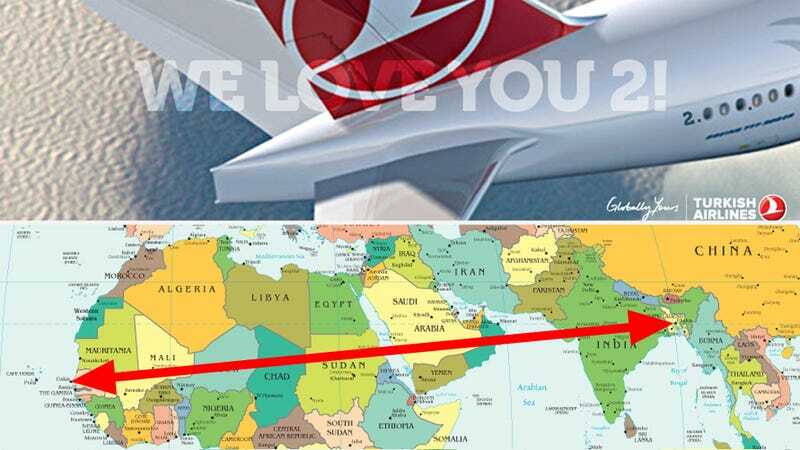 Once they landed, it took nine hours for Valdivieso and Vo to convince Turkish Airlines that they were supposed to be in Africa and it was a three hour wait after that before they got a free six-hour flight to Senegal. It took two days for their luggage to catch up with them. So how did the codes get mixed up in the first place? It appears that Valdivieso booked over the phone, as the Times article states, "Officials with the carrier insisted that they had to track down and hear the recording of Valdivieso booking a trip to Senegal before they could acknowledge that the wrong airport code had been put on their tickets." Valdivieso must have booked over the phone, and the attendant must have misheard the destination. After the trip, Valdivieso tried to get some kind of compensation from Turkish Airlines. "I have called them every Friday for the past four months," said Valdivieso. "They told me each time that they will review my case and get back to me. But they never do." Only when Valdivieso got in contact with the Times, who then contacted Turkish Airlines, did the couple get two free economy class tickets to any Turkish Airlines airport as compensation. They also got a piece of advice from the airline that is useful to us all. "Travelers need to know their airport codes," George Hobica, founder of the travel site Airfarewatchdog.com, told the Times. "You need to go on your smartphone and check that they're right."